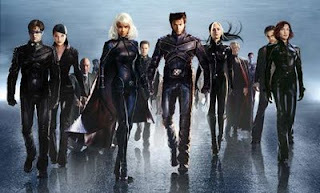 I couldn't help but let my thoughts wander to the likes of the Fantastic Four and the X-Men. I'm not a geek, I swear, just bear with me. I almost just said "bare" with me, but then that would be an entirely different and inappropriate blog. *Ahem* back to the point. Have you ever seen the climax to an X-Men movie that involves only one of the heroes saving the day? Typically, even the strongest member is quite vulnerable alone. They all have to work together. Each of them has been given a gift to provide unity as they work together to become one harmonious entity. These characters accept their gifts for what they are and do their best to maximize the potential of that gift. You don't see Wolverine trying to turn invisible, or Cyclops trying to fly. God has divinely bestowed upon each of us special gifts meant exclusively for us. Maybe I think turning invisible is super cool, but my gift is to shoot laser beams out of my eyes. I need to learn how to harness that gift to best serve the team I am working with in this crazy world. Why did The Big Guy do this? Why did He give us each something different instead of giving us each everything we need? I think it is because we need to learn to work together, to become one, to attain the most Christ-like, God-like state we can together. I hope this is a short test-run of your Sunday School lesson, because we (ah, the collective "we") could use more of these types of lessons to wake us up after Sacrament meeting. You are SO a geek! Even I wouldn't do this. What is that sound? Oh yes, all the geeks of the world simultaneously falling for me after reading this post.